Filipino boxers, as well as the Mexicans, make weight for the Pinoy Pride 38: The Philippines vs Mexico. In the Main Event, longest Filipino world champion Donnie "Ahas" Nietes (38-1-4, 22KOs) weighted in at 112 lbs and the former world light flyweight champion Edgar Sosa (52-9-0, 30KOs) of Mexico weighted in at 111.5 lbs. 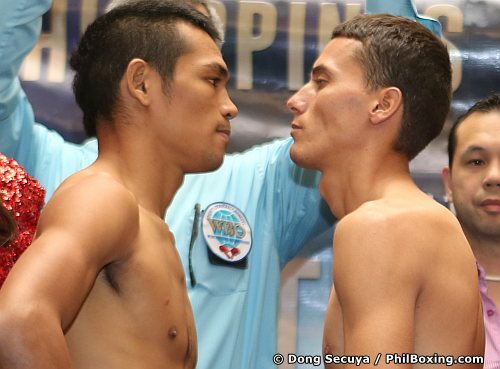 Nietes and Sosa will fight for the vacant WBO international flyweight title. In the co-main event, Mark "Magnifico" Magsayo (14-0-0, 11KOs) weighted in at 125.5 lbs while Ramiro Robles (13-5-1, 8KOs) of Mexico stepped the scales at 123.5lbs. Magsayo is set to defend his WBO international featherweight title against the Mexican warrior Ramiro Robles in a 12 round action fight. 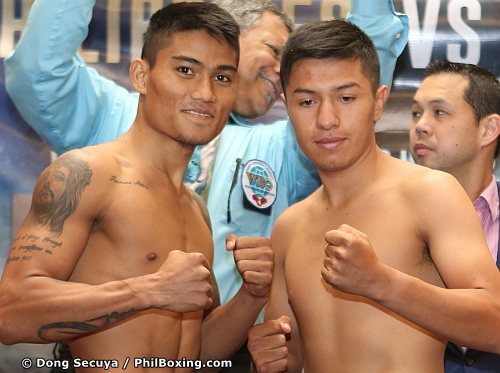 In the undercard, WBO Asia Pacific bantamweight champion, 'King' Arthur Villanueva (29-1-0, 15KOs) weighted in at 117.5 lbs and the Mexican boxer Juan Jimenez (22-10-0, 15KO) was weighted over the limit at 119 lbs in the first try and 119 lbs in the second try. The weight limit in the bantamweight division is 118 lbs only. Because of that, Jimenez will wear a heavier 10 oz gloves on the fight, and if he wins the title will be vacant. Joel Siapno 151.5 lbs vs Isaac Freeman 150.5 lbs. for the 6 rounds middle weight title fight. Ben Garcia 143.5 lbs vs Latorie Wood berry 143 lbs. for 4 rounds in the junior welterweight division. Cesar Hernandez 159 lbs vs Martin Murillo 153 lbs for the 4 rounds in the junior middleweight division. Ezra Hernandez 155.5 lbs vs Abraham Calderon Ruiz 154 lbs for the 4 rounds in the junior middleweight division. Nietes vs Sosa will happen at the StubHub Center, Carson, California, USA on September 25, 2016 (Philippine time), the fight will probably start at 8am. Photos credit to philboxing.com and boxingscene.com.